This small collection of military artifacts includes photo albums, uniforms, communications, equipment, and field artillery from WWI, WWII, the Seventh Signal Command, and the action in Grenada. There is also information regarding the historv of the fort itself. It began as Camp Ritchie in 1926, a camp of the Maryland National Guard. During WWII, it was used for training by the Army's Military Intelligence Division, it was also used by the Office of Strategic Services (OSS), training agents in the use of explosives and guns. Address : 323 Van Brunt St. 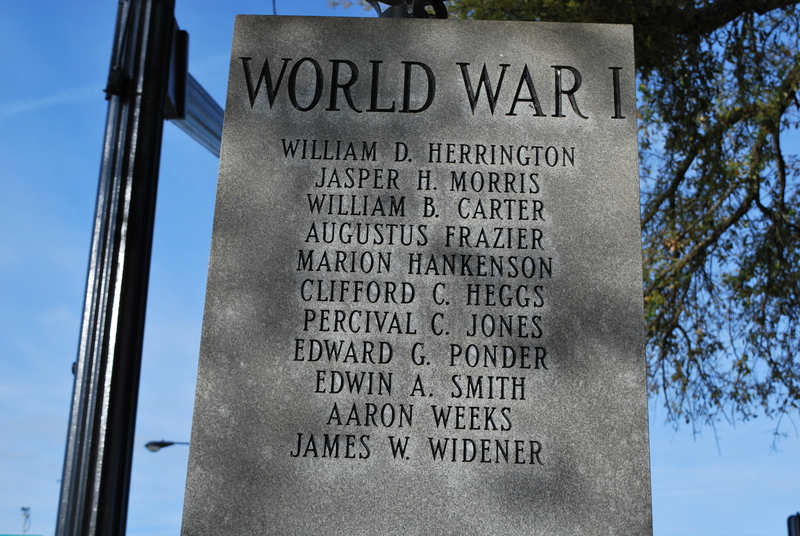 This memorial, which honors those local heroes from Red Hook who died while serving their country in World War I, was dedicated in 1921. 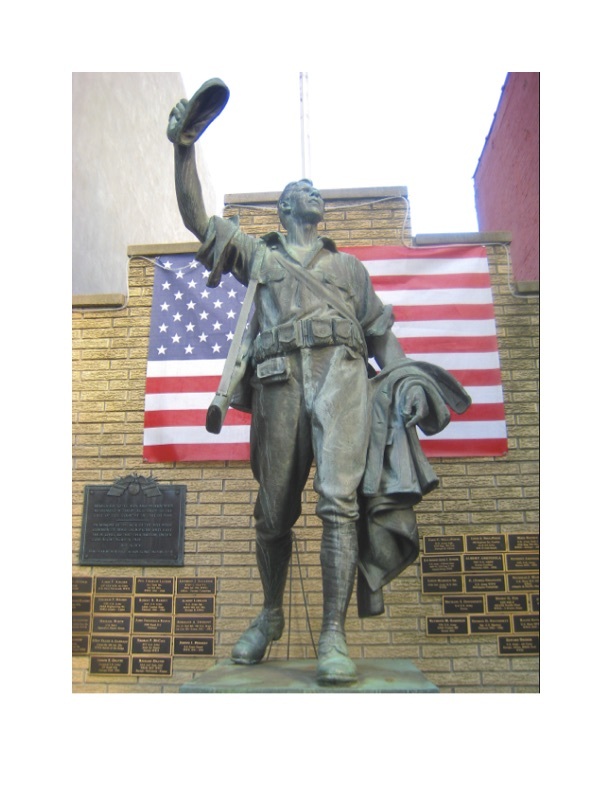 Augustus Lukeman (1872–1935) was the sculptor commissioned by a war memorial committee, which solicited voluntary contributions totaling $10,000 from the citizens of the Third Assembly District for the sculpture. Arthur D. Pickering was the architect who designed the granite pedestal. The derivation of the term doughboy remains in question. It was first used by the British in the late 18th and early 19th centuries to describe soldiers and sailors. 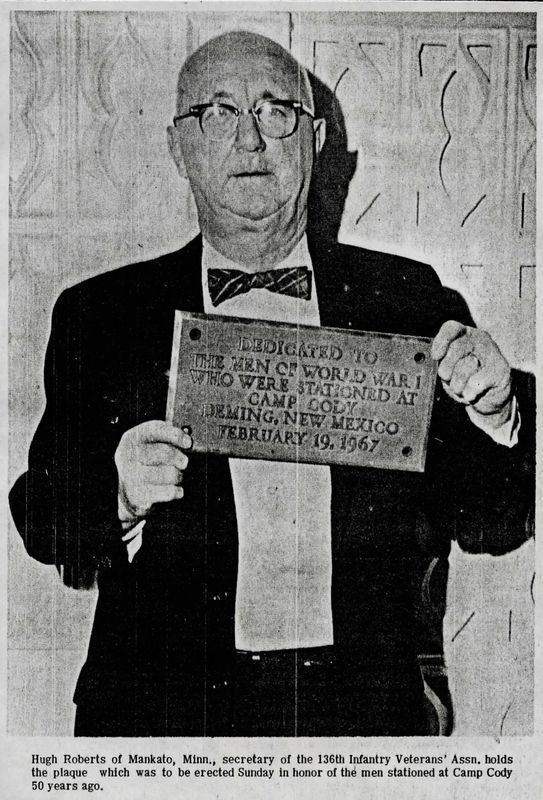 In the United States the nickname was coined during the Mexican-American War (1846–1848), and was widely popularized during World War I (1914–1918) to refer to infantrymen. After the war, in which Americans saw combat in 1917-18, numerous communities commissioned doughboy statues to honor the local war heroes. The Red Hook Doughboy was one of nine such statues erected in New York City’s parks. The sculptor Augustus Lukeman was born in Richmond, Virginia, in 1872, and studied art with the well-known American sculptors Launt Thompson and Daniel Chester French, and at the famous École des Beaux Arts in Paris, France. He had a prolific career, and was affiliated with many arts organizations, including the National Sculpture Society, National Academy of Design, and the Architectural League. In New York City, his works also include the Prospect Park World War I Memorial (1921) on which Pickering also collaborated, and the Straus Memorial (1915) on Manhattan’s Upper West Side. Lukeman depicts the doughboy in an active pose, head held triumphantly upright, his hat held aloft, and a rifle slung over his shoulder. Over time the monument suffered from weathering and vandalism. The bronze honor roll tablet was stolen around 1971. 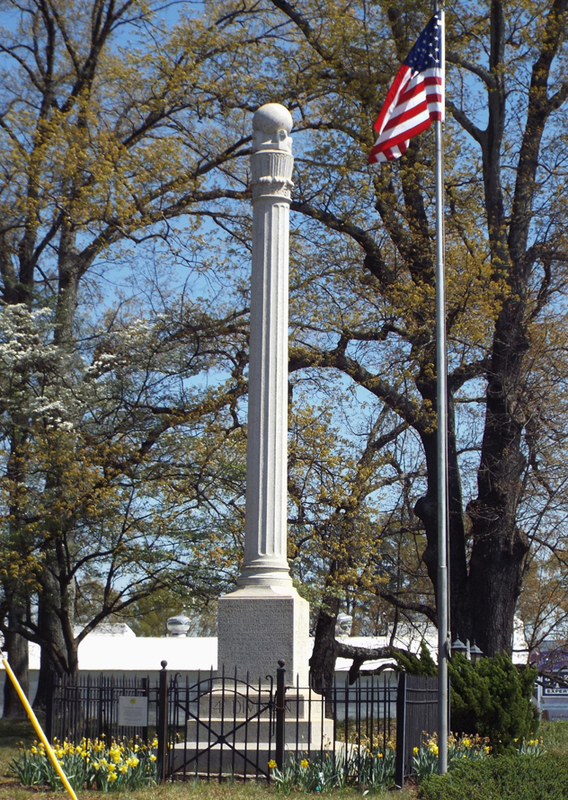 In 1972, custody of the monument was transferred to the Veterans of Foreign Wars Post #5195, located at 321-325 Van Brunt Avenue in Brooklyn. 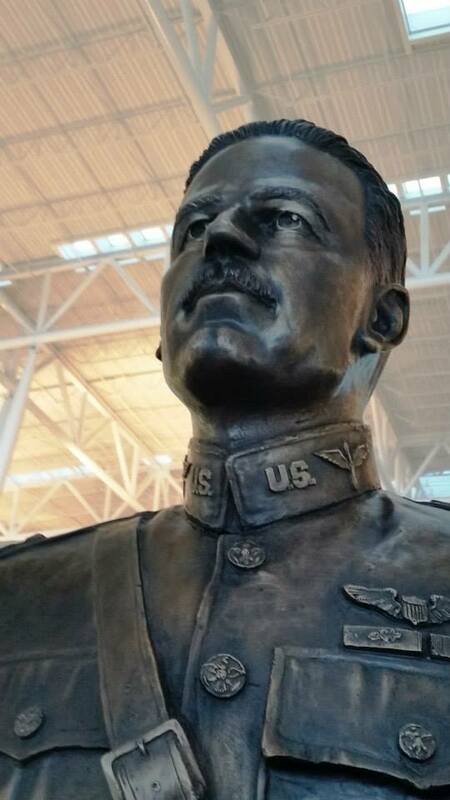 At that time the bronze statue was cleaned, the pedestal recut, and a new honor roll fabricated. 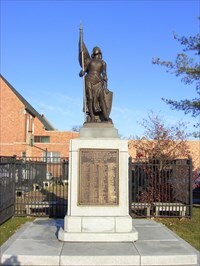 Description : Originally a WW1 monument, now an all wars memorial. Individual bricks are placed in the plaza, with the names of Brooks County military. 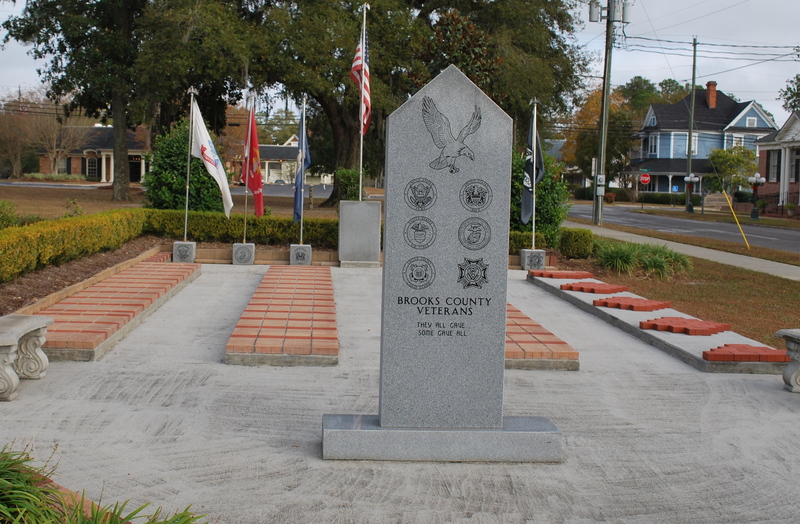 The memorial is sponsored by VFW Post 5659, Quitman, GA. Address : Brower Park, Kingston and Brooklyn Aves. 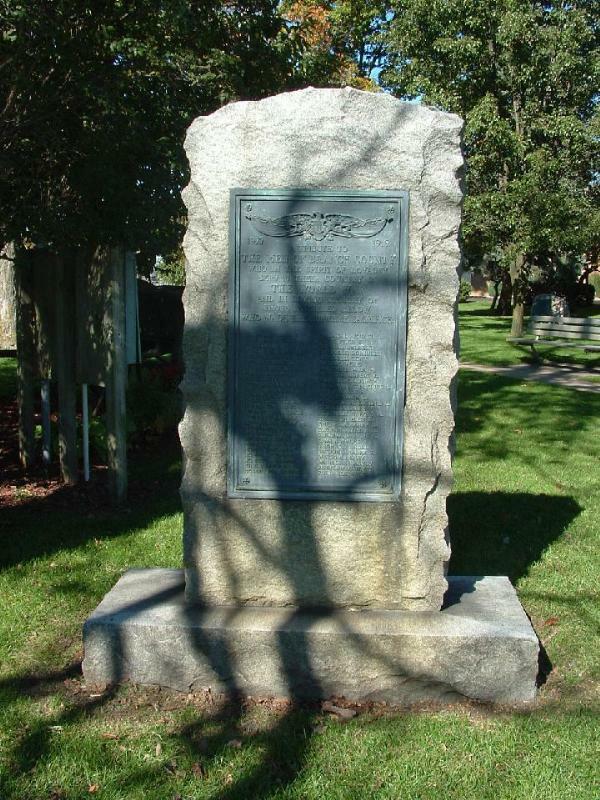 Installed in 1919, this stone stele has attached to it a commem­orative plaque. lt was donated by the Albany Heights Patriotic league as a tribute to the men from the Albany Heights District who died in service in WWI. Address : 219 N. Prairie St. 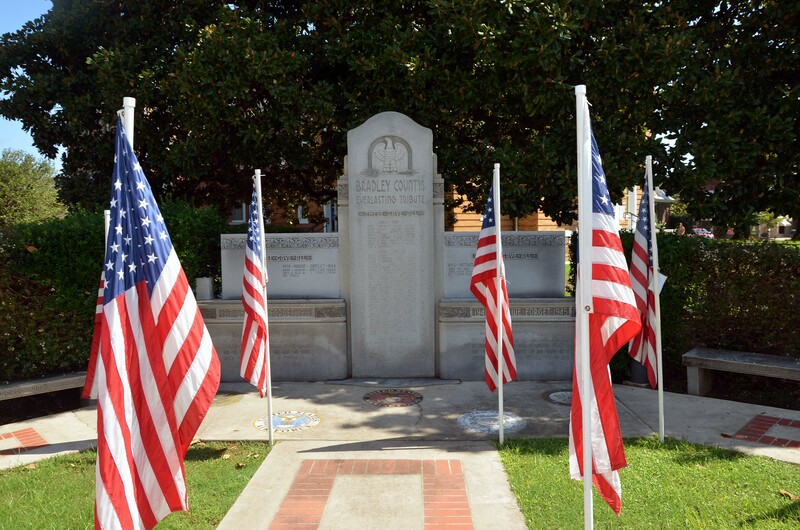 Description : "In Memory of Bullock County World War Soldiers, Erected by American Mothers of National Defenders Chapter, Service Star Legion, 1917-18, Dedicated 1936." 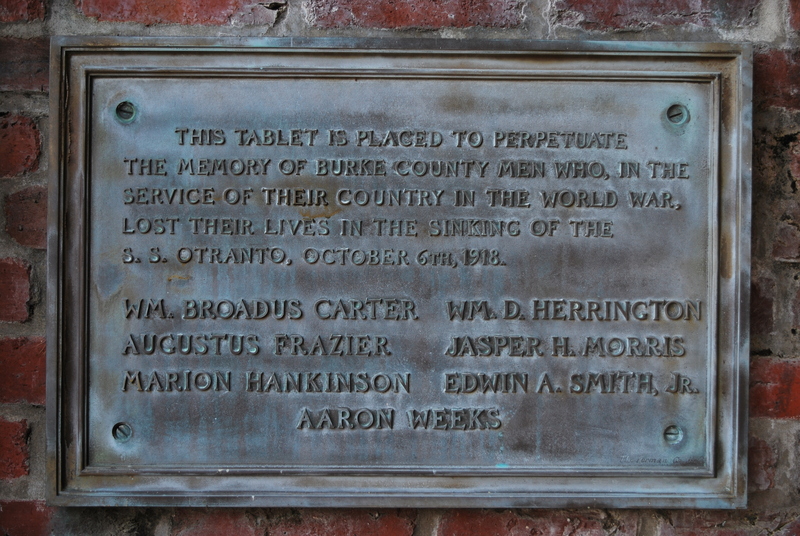 Description : The tablet at the county courthouse is inscribed, “This tablet is placed to perpetuate the memory of Burke County (Ga) men who, in the service of their country in the World War, lost their lives in the sinking of the S.S. OTRANTO, October 6th 1918.” The names of seven local victims are listed. Description : Burke County Courthouse in Waynesboro, Georgia is a Carpenter Romanesque building completed in 1857. It was listed on the National Register of Historic Places in 1980. 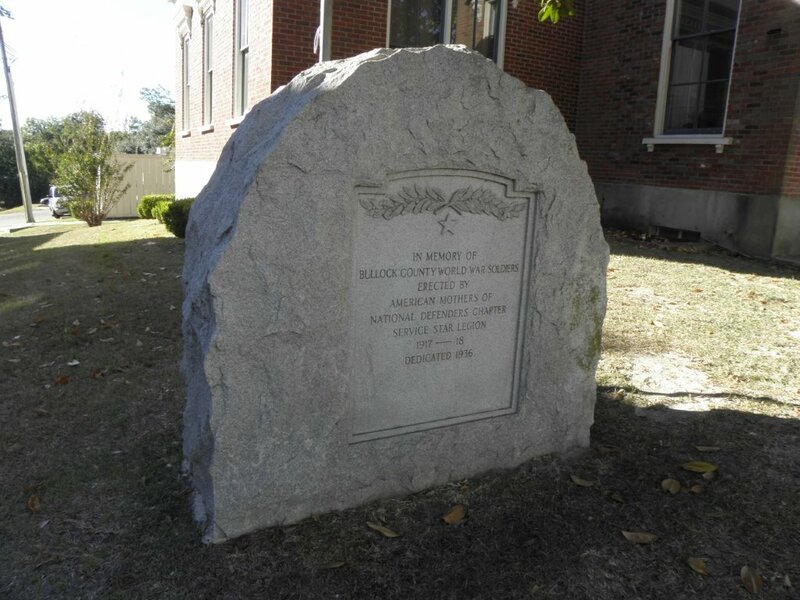 At the entrance of this courthouse is a plaque in memory of those from this community that lost their lives in the S.S. Otranto sinking, October 6, 1918. C.A. Pear designed this building and it was constructed by W.M. Nordmann in 1931. The building cost $25,000 and was built using a county mill levy and funds from the City of Flaxton. It is also known now as the Flaxton Memorial Hall. The building was designed with an auditorium, stage, dressing rooms, meeting rooms, bathrooms, a kitchen and dining room, and even a two-cell jail. Today it still serves the community as a center for gatherings and meetings. Veterans Memorial Building, Albany, CA; Alameda County, GSA-Building Maintenance, 1401 Lakeside Or., 10th Floor, Oak¬land, CA 94612; Outdoors. Free. 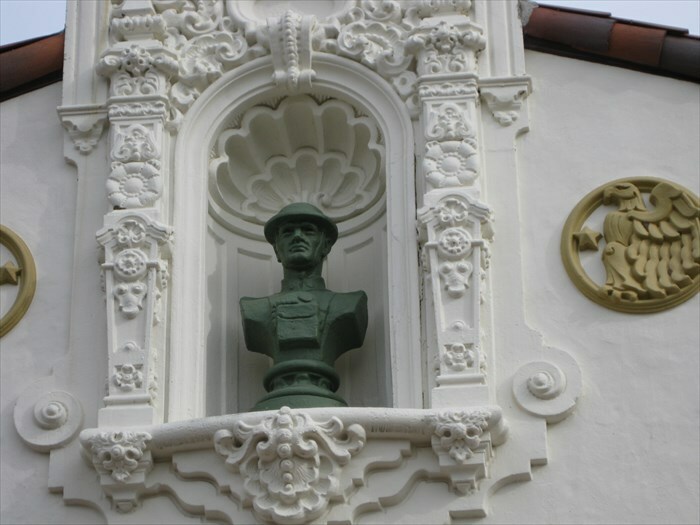 At the south entrance of the building is a concrete bust of a sol¬dier, high on the wall of the building in an ornately decorated niche. The soldier wears a uniform and helmet. 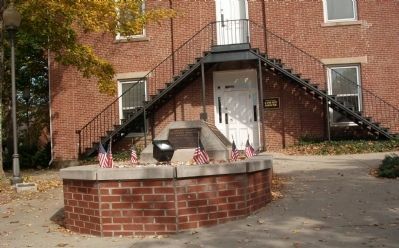 It was placed here in 1931. when the building was constructed, to honor the veterans of WWI. 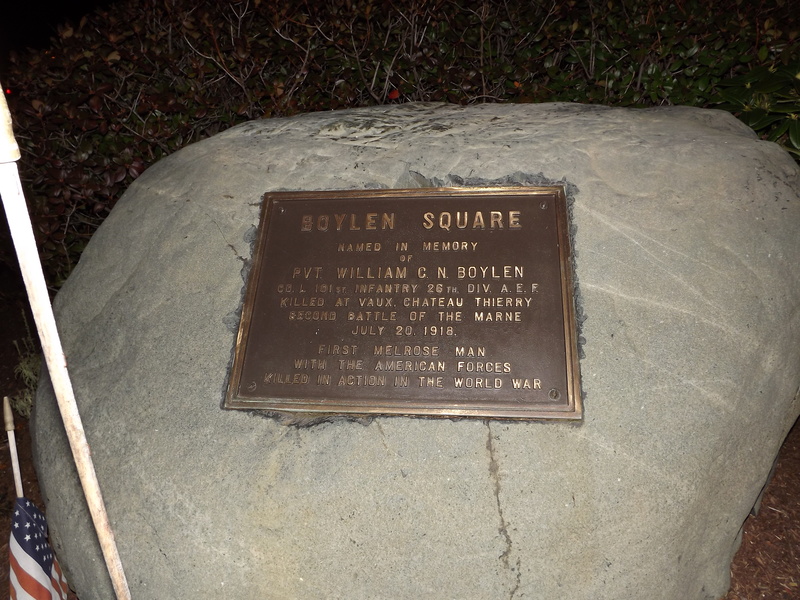 City memorial park consisting of inscribed black granite. Names of service members who died in service are inscribed on main tablets. 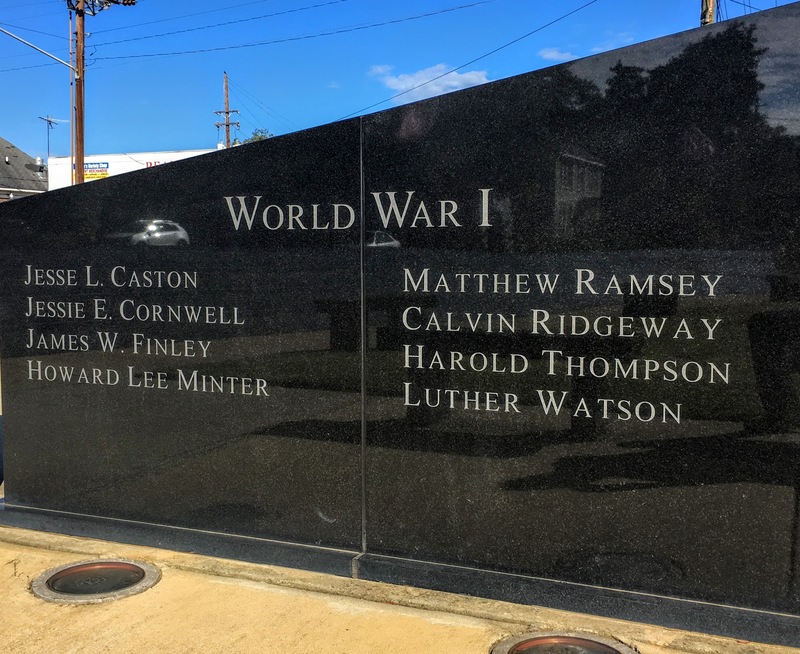 Eight names from WW1 are listed here. 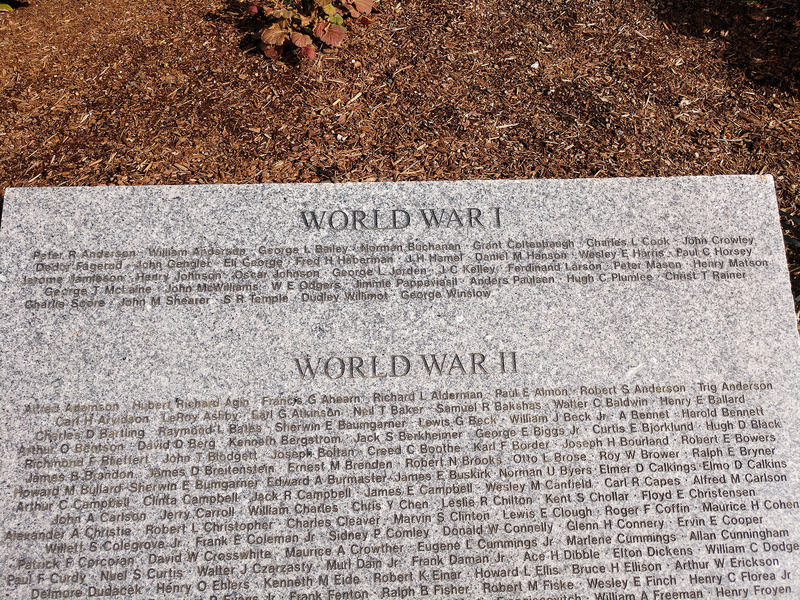 Names and information of others that served are inscribed on adjacent tablets. 1800 Cabrillo National Monument Dr., San Diego, CA 92106-3601 ; Daily 9-5:15. later during summer. Carload $5.00. This park became a national monument in 1913 and the primary focus is on the explorations of Juan Rodríguez Cabrillo In 1542. It became important as a coastal defense site for WWI and WWII, and several remnants of defense facilities can be visited here. On the ocean side off Cathell Rd. arc two Panama mounts which held WWl vintage 155 mm guns that could track and shoot at a moving ship, or he turned toward Mexico in case the Japanese were to attack from that direction. Also open arc a base line station used in determining the range and position of the enemy for directing artillery fire, and a 60" search ­light installation, where the light rose out of a concrete bunker when needed. The Old Point Lighthouse, built in 1854-55 and uses! for storage and as a radio tower during WWII. Fort Rosecrans was located here on Point Loma during WWI and WWII, and in November of 1999 a museum exhibit was opened to the public, portraying the stories of the soldiers stationed here. 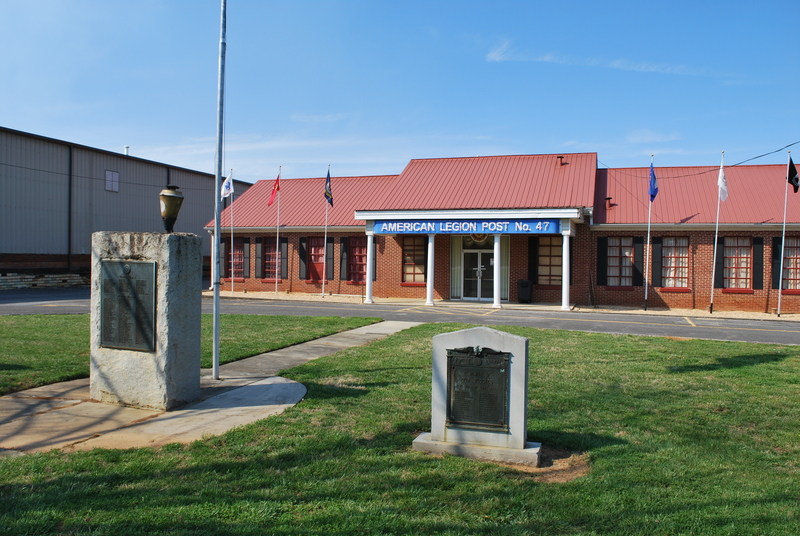 It is located in a small three-room building erected in 1916 as the Army Radio. Visitors can see film clips of the Coastal defense guns being fired. personal memorabilia, a 16-inch shell, and displays explaining the operation of the guns. On site is a library collection of 2,000 volumes relating to the history of the site. Description : Dedicated by the William Forney Chapter of the United Daughters of the Confederacy. Memorial was removed. Exact location unknown. HORSESHOE, OPENING TO THE EAST. 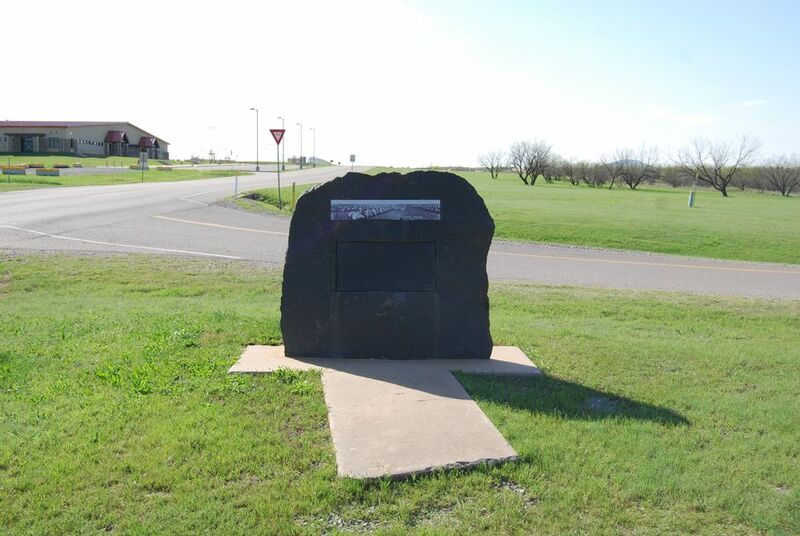 THE MARKER IS AT THE SITE OF THE NORTH ENTRANCE TOL THE CAMP. STOVES.”JITNEYS” AND A TROLLY LINE PROVIDED TRANSPORTATION TO LAWTON. HOME FOR THE NEXT SIX MONTHS. HERE. A MARKER ON GRIERSON HILL OVERLOOKS THE ENCAMPMENT OF PRESIDENT TRUMEN’S BATTERY F.
OFFENSIVE, ONE OF HISTORY’S MOST DECISIVE CAMPAIGNS. SUMMER TRAINING CAMP FOR THE OKLAHOMA NATIONAL GUARD. LASTING AND GRATEFUL MEMORIALS TO THE HOST OF BRAVE SOLDIERS WHO TRAINED HERE IN FREEDOM’S CAUSE IN WORLD WAR ONE.